"I sit up straight. She's talking to me. No one ever talks to me. Oh, how I wish I knew human and could answer her. Instead I nibble on my peanut." 14 different points of view, none of which belong to either main character, weave together an irresistibly sweet romance between two college students. I picked this book up while picking up some necessities from Target. Why? Because I had moved, most of my library had just been relegated to storage while I'm living out of my mother's, and because the blurb on the back presented a book that sounded cute and fun, while being completely different from what I'd read before. 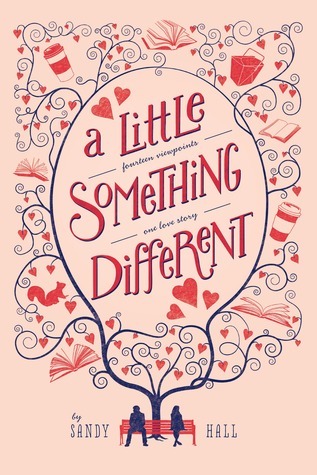 Told from the perspective of fourteen different voices, A Little Something Different, is a ridiculously cute book. I loved how we never had a snippet from the POV of either Gabe or Lea, the main characters, but rather had their creative writing teacher, a Chinese food delivery guy, the oldest bench on campus, her roommate, and even a squirrel among the list of 14 tell the story of their budding romance. A Little Something Different definitely doesn't take itself too seriously in the telling of the story; however, it more than lives up to its claim of being a fun, quick read you can lose a day or two to. I'm eagerly looking forward to Hall's second novel, Signs Point to Yes.